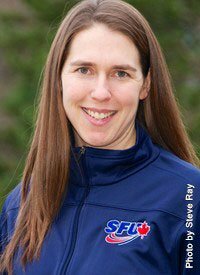 Gina is a native of Beaverlodge, AB and is entering her second year as the head coach at Simon Fraser University. In her first season, Schmidt lead the Clan to more wins than the previous three years combined, making it their best season since joining the GNAC and the NCAA. Schmidt came to SFU after five years as the first assistant for the University of Montana Grizzlies. In university, Schmidt played for the NCAA Division I Oregon State Beavers where she was a four year letter winner and All-Pac 10 selection in 2000. She currently ranks fifth in Oregon State history in career kills and seventh in career digs. She was a two time CoSIDA Academic All-American and in 2002, was named the NCAA Women of the Year for the state of Oregon. In addition to having nine years of experience with the Canadian National Team, including four with the senior women’s team, Schmidt spent six years playing professionally as an outside hitter and setter in the top divisions in France, Germany, Holland, Switzerland and Finland.